How likely are we to find a definitive biosignature once we begin analyzing the atmospheres of nearby rocky exoplanets? We have some ideal candidates, after all, with stars like TRAPPIST-1 yielding not one but three potentially life-bearing worlds. The first thing we’ll have to find out is whether any of these planets actually have atmospheres, and what their composition may be. ‘Habitable zone’ is a fluid concept, and that’s not just a reference to liquid water on the surface. A relatively dry terrestrial planet, one with little surface water and not a lot of water vapor in the atmosphere, might avoid a runaway greenhouse and manage to stay habitable in an orbit closer to a G-class star than Earth. A planet with an atmosphere dominated by hydrogen could maintain warm temperatures even at 10 AU and beyond. So we’ll need to find out what any exoplanet atmosphere is made of, and weigh that against its orbital position near its star. Image: An extended habitable zone that captures some of the more modern thinking about habitable planets. The light blue region depicts the habitable zone for planets with N2-CO2-H2O atmospheres. 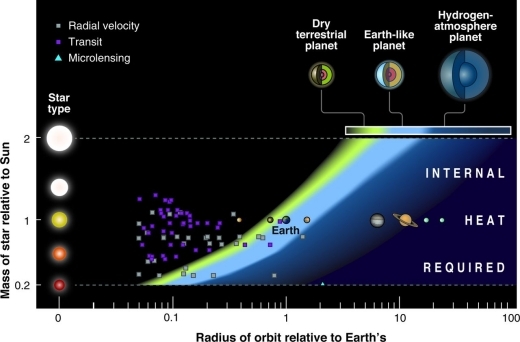 The yellow region shows the habitable zone as extended inward for dry planets, with little surface water and little water vapor in the atmosphere, as dry as 1% relative humidity. The outer darker blue region shows the outer extension of the habitable zone for hydrogen-rich atmospheres and can extend even out to free-floating planets with no host star. The solar system planets are shown with images. Known exoplanets are shown with symbols [here, planets with a mass or minimum mass less than 10 Earth masses or a radius less than 2.5 Earth radii]. Credit: Image and caption by Sara Seager. When we use terms like ‘Earth-like’ in relation to atmospheres, we’re talking about nitrogen, oxygen and carbon dioxide, but we also have to remember that atmospheres develop and change over time. The early Earth would have begun with abundant hydrogen and helium, but volcanic eruptions could later supply carbon dioxide, water vapor, sulphur and more. We needed a huge oxygenation event two and a half billion years ago to bring oxygen levels up. Exactly where would an exoplanet be in its development during the time we are able to observe it? So assume we start examining those interesting transiting worlds around TRAPPIST-1 and find that one of them shows traces of oxygen. Cause for celebration? Certainly, but we’re still a long way from determining whether life is present. Because there are models for oxygen-rich atmospheres that are completely abiotic. TRAPPIST-1 is an M-dwarf, and we know that ultraviolet light from the star can break down carbon dioxide, adding oxygen to the mix. Now that sounds pretty straightforward, and surely a simultaneous detection of oxygen and methane would make a strong case for life. But even here, we have to be careful. If there are abiotic sources of oxygen, there are also abiotic sources of methane, even if most of the methane found in our own planet’s atmosphere is associated with living processes. Volcanism is one methane source, and we’ve learned recently that carbon-rich micrometeoroids can produce methane as they burn up upon entry into a planet’s atmosphere. Systems with larger amounts of dust than our own could conceivably produce a high enough methane signature in a planetary atmosphere to be noted by our space observatories, further complicating the search for life. Here again we’ll have to pay particular attention to the age of the system we’re studying, for systems with dense debris disks are those likely to produce this effect, with planets perhaps undergoing their own version of our Late Heavy Bombardment, when some 3.9 billion years ago our world was pummeled by millions of collisions. When I said yesterday that it was possible we might get a biosignature detection within as little as ten years, what I was really saying was that we might get some evidence of biology, but very likely it would be ambiguous and hotly contested. Rather than a sudden announcement that life has been found in another star system, the news is likely to emerge as a battle of competing analyses, trying to determine whether what we see could be explained without implicating life. We also need to pay attention, as Sara Seager and colleagues are doing, to what other gases might be involved in biosignatures. Indeed, life on our planet produces thousands of different gases, most of them in small quantities that accumulate little in the atmosphere. Most are produced for reasons specific to the organism they support, and they do so guided by little more than evolutionary selection. The point here is that life on another world may have surface and atmospheric conditions that produce chemistries profoundly different from Earth’s. Hence Seager’s interest in studying all the molecules that exist in gas form in a planetary atmosphere in conditions similar to the temperature and pressure of Earth. A recent paper on this work presents results from an examination of 14,000 molecules, about 2500 of which are hydrocarbons, with the goal of eventually producing a truly comprehensive list of biosignature gases and the false positives that accompany them. If there is one thing we can probably state with some confidence, it is that early exoplanet atmospheric studies will produce surprises. Getting ready for them is what studies like Seager’s are all about. What we’re going to need as we begin to detect ambiguous evidence for biosignatures is a large space telescope well beyond WFIRST in capabilities, one capable of pulling in atmospheric data from enough exoplanets that we can begin to develop a statistical understanding of what we’re seeing. Designs like LUVOIR (Large UV/Optical/Infrared Surveyor) and HabEx (Habitable Exoplanet Imaging Mission) are under study, even as we look beyond them to the kind of mirror technologies that may allow still bigger instruments and more comprehensive analysis. The Seager paper is Seager, Bains and Petkowski, “Toward a List of Molecules as Potential Biosignature Gases for the Search for Life on Exoplanets and Applications to Terrestrial Biochemistry,” Astrobiology 16(6) (June 201), 465-485 (abstract). I think that the discovery of ExtraTerrestrial Intelligence, if it ever occurs, will follow a similar path. There is nothing more interesting than the thought of extra terrestrial intelligence . The thought if it’s discovery is mind blowing. However, my slight reservation about the concept is that it can and has been used to detract from the very existence of ANY extraterrestrial life . However “simple” ( an oxymoron surely ) . Yet proponents of the contentious “Rare Earth” theory dismissively down play the concept of what they call “simple” , unicellular life as no more than a vehicle to discredit extraterrestrial intelligence . Geocentricism is alive and kicking. This is of course a nonsense . No life is “simple”. Even the most basic unicellular , prokaryotic life on Earth , now or in the past , is infinitely more complex than the multitude of bio molecules from which it is constructed and/or evolved . The discovery of extraterrestrial life , any extraterrestrial life, any where , any time would be the greatest single discovery in human history with huge practical and existential implications . Life cannot and should not be categorised in such a rudimentary dichotomous way. Or dismissed . All life forms on Earth today by their very existence are highly evolved or they wouldn’t still be here . Such a discovery , if made – especially if made within a few decades as our nascent ability to look for remote biosignatures rapidly matures – would likely occur on a nearby or relatively nearby planet. If so ,how can that be coincident ? Life on two separate planets ,so close together in a huge Universe could not possibly be by chance and would surely indicate that life’s occurrence was ubiquitous . A total paradigm shift with that one momentous discovery . A sample size of one tells us nothing and does not by default infer rarity , but a sample size of two is hugely indicative . The converse would not necessarily be true. The non discovery of life nearby does not rule out life’s wider existence , or even ubiquity , merely that the technology required to find it is insufficient . Even if detection techniques turned up nothing within say a couple of hundred light years , big as that sounds what is it in terms of the local galactic environment ? Let alone the Milky Way as a whole or the ( very much ) wider cosmos ? Interesting view of how the signatures for “life as we know it” (free oxygen, liquid water etc.) may not be enough for LAWKI to survive other associated conditions. I think that we will find that each planet will be different, and that will be a lot more exciting scientifically than finding “Earth 2.0” with rubber-forehead aliens. I think that extraterrestrial life will turn out to have a much greater breathtaking variety than anything we see today on the earth. How to recognize it from our “thru a glass darkly” point of view is matter of conjecture at this point. I wonder how much of a difference stagnant-lid versus mobile-lid plate tectonics would make to the observability of biosignatures, particularly in light of research suggesting that a lack of mobile-lid tectonics would not necessarily be an obstacle to long-term habitability. KEPLER MULTI-PLANET SYSTEMS EXHIBIT UNEXPECTED INTRA-SYSTEM UNIFORMITY IN MASS AND RADIUS. A SPECTRAL APPROACH TO TRANSIT TIMING VARIATIONS. Kepler’s Dark Worlds: a Low Albedo for an Ensemble of Neptunian and Terran Exoplanets. We may have found 20 habitable worlds hiding in plain sight. Just maybe we should be looking for ET in this data also, are all those flares really just flares??? Surface Imaging of Proxima b and Other Exoplanets: Topography, Biosignatures, and Artificial Mega-Structures. Now if we could just see those Canali! Stellar Echo Imaging of Exoplanets. telescope with an optically-perfect baseline of ~2 km. Nanohmics -using stellar echos to find exoplanets. This is the Sept. 27, 2017 updatet from the NIAC 2017 Chris Mann. The video first 23 minutes is covering his discussion and brings up the point of the need for very fast Photometry. “When a star has a solar the light will bounce off of any exoplanets. This could then be detected by fast sensor telescopes. Any fluctuation in the star and not just solar flares can be used in this method. A NASA NIAC will use interstellar LIDAR to detect exoplanets. This may also have the ability to detect details on the exoplanets surface. The question I’m wondering about with systems like the Trappist1 where the planets are the far side and fully illuminated could a flare on the back side of the red dwarf to the earth act like a cameras flashbulb in the UV to give a much better contrast ratio. Except that the chances of these molecules made by non-biological processes are also high. Amines are commonly found on extra-terrestrial bodies. Indeed, the whole point of the Miller-Urey experiment on abiogenesis was to show how easily amino acids could be made. Similarly, Titan is awash in hydrocarbons, and it wouldn’t surprise me if Titan also has very many small molecules composed of C,N and H.
The problem I have with their database is that what we want is molecules that are energetically unlikely, and therefore created by biology by capturing energy to create them. Just looking at the description of the molecules listed, biologic sources are mentioned, but not non-biologic sources. For a useful list of molecules, we really want to pare it down to remove those that can be made by non-biologic processes, leaving candidates that can only be biologically created. To maximize our chances of recognizing biosignature gases, we promote the concept that all stable and potentially volatile molecules should initially be considered as viable biosignature gases. I would argue that this is the wrong approach, guaranteed to fuel the same arguments over the ambiguity of their manufacture if detected. If we could reliably detect chlorophyll, and we detected it on an exoplanet, there would be no question as to its biologic origin. The authors have gone in the opposite direction for reasons of tractability, but with the result that the molecules listed are not uniquely biologic in origin. At this point, with our sample of one, we can only easily hope to detect terrestrial-like life on worlds with surface living organisms. Therefore we should focus on techniques that will reliably detect such life, while leaving open the issue of detecting other forms of life that use very different chemistries and/or habitats. Good points. I note that the authors are all from an astronomy , astrophysics or physics background . Astrobiologists at a push,maybe, but a specialty that is more “Astro ” than biology . Where are the biologists and/ or ” bioastronomers “? Detecting living organisms seems to be an almost anthropomorphic way of looking for life in the universe. While this paper excludes the detection of artifacts, a field better suited to the SETI people, the underlying assumptions are based on the Drake equation. We assume that simple life is more common than complex life, which in turn is more common than intelligent life, which in turn is more common than civilizations with high technology capabilities. Logically, success should come more quickly if we can detect the most common form of life on exoplanets. However, this logic is based on the assumption that for any world, life is restricted to its homeworld, or at least, to its solar system. Technology, however, breaks that assumption. The Breakthough Starshot folks are already talking about suitable “astronauts” (C. elegans and tardigrades) as science experiments on their flights. It is a simple step to imagine that standard packages of organisms be placed on our early interstellar flights and that some may even seed suitable worlds with terrestrial life. More probable is that machines (robots) will come to dominate our solar system, for exploration and resource exploitation, simply because they do not face adaptation issues and are far more flexible in design than biological organisms. No post-human species can be as flexible in function as our designed machines. When suitable propulsion technques are available, our machines will migrate out across the galaxy. Even traveling slowly, they might be expected to colonize the whole galaxy in a cosmic blink of an eye. That they are not evident already is perhaps a strong argument that humans are the first technological civilization to evolve. But if machines have expanded throughout the galaxy, then perhaps the most ubiquitous sign of life (or former life) is these machines and the artifacts they produce. Coming full circle, the most common artifact they might produce is “terraformed” worlds. If so, the life on such worlds might have remarkably conserved core biochemistries. Sometine in the bext few centuries, our probes to exoplanets with life might just send back the news that hints that this directed panspermia has taken place. False positives of assumed biosignatures is hardly a new problem. It goes back almost a century when scientists claimed that various lines of evidence (including some alleged spectral biosignatures of the sort proposed today) “proved” that Mars has life. Sara Seager co-authored a prescient article with Drake Deming earlier in the year entitled “Illusion and reality in the atmospheres of exoplanets “. It was published on arXiv on 2nd January . It warned of the risks of false positives likely to occur with the first “biosignatures” findings. As has happened already with some of the earlier hot Jupiter characterisations . The hazards of any nascent scientific process and the basis of scientific falsification I guess. Reviving an old hypothesis about the origin of life on Earth. Just as many researchers had come to accept the idea that terrestrial life originated at hydrothermal vents in the ocean, new work by Ben Pearce of McMaster University in Canada and colleagues calls that hypothesis into question, and revives Darwin’s old idea of the origin of life in a warm little pond. Computer modeling by the researchers suggests that the chemical building blocks of life were brought to Earth by meteorites and deposited in small bodies of water on the continents, where they readily assembled to form long-chained molecules such as RNA or DNA. This assembly would have occurred very fast—within a few cycles of the ponds drying out and becoming filled with water again. Thus, the resulting RNA or RNA-like molecules would likely have appeared very early in Earth’s history. The problem I have with the warm pond theory is that long chain molecules rapidly degrade under UV light, exactly the conditions on a prebiotic Earth before the great oxygenation event blocked much of the UV. At some point I will need to read their papers to see how this problem has been resolved, assuming that it has been considered. What if they were at the bottom of a deep pond or lake? Yes I know it would depend on how deep the body of water was. We also should not assume that life on Earth and any other suitable world only had one way to start. It could have been a combination of warm pond, hydrothermal vents, and perhaps even some other methods we have not considered all working together to make organisms. The heartening thing about all this is that terrestrial life did start not long after Earth cooled down. It may have taken a long time to subsequently evolve into complex forms, but it did not take long to get started on a world that was probably pretty hostile otherwise. I think the point from the quoted snippet was that these would be small bodies / pools that cycled through drying out and re-filling. Perhaps the UV would create as well as destroy precursor molecules… if UV is so damaging then each drying cycle would reset the chemistry to square one. OK, well it depends on just what depth of water is required to block the expected UV flux sufficiently to protect long-chain molecules. A pond could be a few metres deep and still dry out during a prolonged drought. Anyone from Australia or similar places can attest to that :-). It depends how long you think a ‘cycle’ could be. Also how would depth variation across a pond influence this? You might get flow between shallow and deep areas. And… to some extent wouldn’t UV be NEEDED to energise reactions a la Urey experiment, etc? Oxygen produced the ultraviolet splitting of Co2 as well as H20 will result in an atmosphere with only one percent oxygen which is what the percentage of oxygen was in Earth’s early atmosphere. I am not an expert in atmospheric science, but I think Earth’s atmosphere today would show much stronger spectral lines of oxygen if viewed through a spectroscope from a long distance today than the percentages of oxygen in an Archaen type atmosphere before life started, so scientists should be able to differentiate between trace gases of oxygen and a larger percent such as 21 percent oxygen. Also ozone is a gas which must be included in the spectral signature. If we have Nitrogen, oxygen, methane, and ozone and the planet is in the life belt around a G class star like our Sun, we can assume that higher animal forms of life must exist there. Furthermore methane only hangs around in our atmosphere for twelve years before chemical reactions change it or remove it which involve ozone removal. The Earth’s early atmosphere during the Archaen period was still anoxic, but both O2 and CH4 increase with the addition of life. Methane has to be continually supplied to stay there and volcanism only accounts for trace amount of methane less than found in today‘s atmosphere with life. Any methane not produced by life would still combine chemically with the trace amounts of non photosynthetic oxygen and remain as only trace amounts. A planet closer to the Sun than our Earth or in the life belt around a star with little water is bad news for life because it means that it has lost most of it’s water due to evaporation, or the spitting of water into hydrogen and oxygen by ultraviolet light. This has happened on Venus and there is more DH20 in it’s atmosphere, than on Earth because the solar wind has stripped away the lighter protium or 1H, (ordinary hydrogen without a neutron) leaving the heaver deuterium behind which tells how much water loss there has been in a planet‘s atmosphere.. It would be nice if we could determine that spectroscopically of exoplanets in the future. A dry, Earth sized planet might also make it more difficult for life to evolve if there can even be such a planet. The biosphere would be severely restricted. If might loose it’s water too fast. Also it is too early to assume we are the only intelligent forms of life in our galaxy. We haven’t been looking very long. To be more specific, a planet without a lot of water might increase the risk of a greenhouse effect since rain takes the Co2 out of the atmosphere through the Urey reaction. The Co2 becomes carbonic acid. It combines with the rock and becomes calcium silicate with further reactions which break it apart to become calcium carbonate and silica or limestone and chert. These are transported through rivers to the sea where they build up in the bottom of the oceans. They becomes subducted as one plate moves beneath another one and is the co2 is re= released through volcanoes over a long time which creates a balance. When there is too much C02, it gets hotter and there is more evaporation of sea water; the rain takes the Co2 back out again when there is not enough, volcanism returns the Co2 back into the atmosphere. This process can get out of balance when Co2 production is faster than the carbon cycle and plants to remove it. Of course this has happened to our world but only in the past 150 years, due to an increase of man made Co2. If there is not enough rain to take the Co2, then the greenhouse effect will increase which might happen on a dry world if there is little water. Your comments make me wonder if Venus had large oceans or a vast global one which led to its powerful greenhouse conditions? Change large and vast oceans to just enough of an ocean to create the greenhouse effect you mention. “In our paper, we offer an alternative approach, which is to use evolutionary theory to make predictions that are independent of Earth’s details,” says Levin. “We still can’t say whether aliens will walk on two legs or have big green eyes. But we believe evolutionary theory offers a unique additional tool for trying to understand what aliens will be like,” explains Levin. The higher DH2O ratio on Venus is evidence that if might have had an ocean but the ocean only existed during Venus early history when the Sun was much less bright. It’s brightness increases roughly 10 percent every billion years. At some point the greenhouse became runaway since Venus is too close to the Sun. A planet inside Earth’s orbit and much closer than Venus with little atmospheric water might not have a runaway greenhouse effect, but it would have a bigger one than one with more water provided it has plate tectonics. The warmer climate might make it harder for life to start there but not impossible depending how much closer to the star it is. I wonder if a planet a little closer in the life belt to a star than Earth with a lot of water without plate tectonics would still have a carbon cycle or not enough of a greenhouse effect since the rain might take too much Co2 out of the atmosphere? Water vapor is a greenhouse gas but is much less absorbent of infrared than Co2. I just remembered that I read somewhere online that in order for there to be plate tectonics, there has to be an ocean so there might not be any Earth sides bodies without plate tectonics. Venus may have had an ocean and plate tectonics but it lost them with the runaway greenhouse effect and loss of ocean a billion years ago. I also read in a book called the Science of UFO’s by astronomer William A. Alschuler that intelligent ET life has to have fingers and hands in order to make and manipulate technology. I agree with this viewpoint so I don’t think intelligent ET’s are four legged like animals. That’s correct… water is the lubricant for subduction. Or tentacles? Or what if they develop telekinesis? Only half joking on that last one. Only half joking? I’m not too sure there’s any room in physics for some kind of mind-generated ‘force’ that can act on objects so I personally would rule that out completely. I wonder if you have any musings as to any mechanism for that? As for the octopus tentacle… it seems to be a fantastic evolutionary answer to developing dexterity in a purely aquatic organism. Each tentacle has a complex shared nervous system allowing it to perform amazing feats, not least of which is the octopus’s ability to gather together stones to block the entrance of their little hidey-holes. Cuttlefish and squid can’t hold a light to the octopus on that front. Of course, the tentacle wouldn’t be very suitable for land-based creatures from a locomotive viewpoint but I can imagine alien natural selection throwing up some kind of hybrid creature or even one that rolls around. If an octopoid type ETI can figure out how to make some method of transportation across land, then they may not need to evolve legs to get around outside the water. Most terrestrial cephalopods and cetaceans are very smart, yet they haven’t really tried living on land. Perhaps because they don’t need to, but it would be very interesting if we could find advanced alien versions of them to see just what would they or could they do. Interesting… I hadn’t heard this before, thankyou. Something to ponder: Jellyfish are pretty low on the ladder when it comes to complex intelligent Earth life – yet their kind have been around far longer than most other creatures on this planet. More evidence that you only need to be just smart and capable enough to survive in this Universe? And why our SETI efforts just aren’t cutting it yet? Black holes growing via the accretion of gas emit radiation that can photoevaporate the atmospheres of nearby planets. Here we couple planetary structural evolution models of sub-Neptune mass planets to the growth of the Milky way’s central supermassive black-hole, Sgr A∗ and investigate how planetary evolution is influenced by quasar activity. We find that, out to ∼20 pc from Sgr A∗, the XUV flux emitted during its quasar phase can remove several percent of a planet’s H/He envelope by mass; in many cases, this removal results in bare rocky cores, many of which situated in the habitable zones (HZs) of G-type stars. The erosion of sub-Neptune sized planets may be one of the most prevalent channels by which terrestrial super-Earths are created near the Galactic Center. As such, the planet population demographics may be quite different close to Sgr A∗ than in the Galaxy’s outskirts. The high stellar densities in this region (about seven orders of magnitude greater than the solar neighborhood) imply that the distance between neighboring rocky worlds is short (500−5000~AU). The proximity between potentially habitable terrestrial planets may enable the onset of widespread interstellar panspermia near the nuclei of galaxies. More generally, we predict these phenomena to be ubiquitous for planets in nuclear star clusters (NSCs) and ultra-compact dwarfs (UCDs).